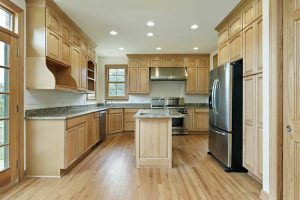 What is the best approach to match cabinets to hardwood flooring? The beauty and durability of your hardwood floors can be matched wonderfully on your kitchen cabinets, if you do it right. Many of us feel inspired to lavish that gorgeous look on both the cabinets and floors in our kitchens. To guarantee lasting harmony, you’ll want to make sure the floors and cabinets are visually compatible, long-term. Many people believe that “wood is wood,” and therefore any kind of wood cabinets and hardwood floor will just naturally match. Some woods do make excellent pairings. Cherry floors work superbly with Oak cabinets, for instance. Hickory seems to blend seamlessly with almost any other hardwood, making it a popular choice for either surface. However, many other pairings simply clash too much to work. An oak floor with maple cabinets will inspire headaches in very little time. Same Wood matches of hardwood flooring to kitchen cabinetry — oak to oak, maple to maple – might be thought to create a unified look and feel. The trouble with that idea is that it’s almost impossible to find an exact match. The finishes and stains used on flooring vs cabinets can vary widely. Within a single wood type, grain patterns and coloring can also give the same species completely different looks. Add to that, installing new cabinets to perfectly match existing hardwood floors must account for aging and wear. Or if you have existing cabinets and want to match cabinets to hardwood flooring, the same considerations apply. A contrasting match between your kitchen cabinets and hardwood flooring allows both elements to claim their own character. Lighter cabinets with darker floors impart feelings of comfort and peace, while darker cabinets with lighter floors feel more opulent. And like paint colors, you’ll want the two woods have similar color, sheen, and texture undertones. Similar graining will also help tie together contrasting woods. It’s important to consult an Artisan when you want to match your hardwood floors and kitchen cabinets. Here at Artisan Hardwood Floors, we’ve been helping Reno/Tahoe homeowners create beautiful living spaces for years. Contact me right away, so we can start turning your dreams into a reality.